Review of Medical Literature by Dr. Alan Feller and Dr. Blake Bloxham, Feller and Bloxham Medical, PC-Great Neck, Long Island. Publication: Dermatologic Surgery: Volume 43, Number 1s, January 2017 ISSN 1076-0512. Authors: Brian Berman, MD, PhD, Andrea Maderal, MD, and Brian Raphael, MD. The authors begin with an overview of normal and abnormal types of healing and include an excellent discussion of the pathways that lead to both hypertrophic scars and keloids. Hypertrophic scar– “…is firm, raised within the site of injury, occasionally symptomatic, and usually develops within 4-8 weeks of injury.” The authors then go on to mention that these scars typically form in areas of high tension. Keloid scar– Can appear many years later and extend beyond the site of injury. Collagen in hypertrophic scars is arranged or organized in a wavy pattern that is parallel to the epidermis. In contrast, collagen within keloid scars are arranged “haphazardly in a random pattern”. Interestingly, the authors note that keloids only occur naturally in humans, therefore analogous animal models may not be adequate for studying this undesirable phenomenon. They go on to admit that the pathogenesis of the scar phenomenon in general is not well understood, but go on to describe the pathways of wound healing as known today. Inflammatory- Begins immediately after skin injury and is complete within the first 2-3 days. The extrinsic clotting cascade is first activated resulting in a Fibrin plug. Cytokines and chemokines released at the site of tissue damage attracts immune cells and proliferation of neighboring cells. Fibroblasts are then recruited to the area and this signals the start of the proliferative phase. 2. Proliferative- Begins in about the first week after injury an can last up to 7 weeks. The clot originally created at the time of insult is replaced by granulation tissue. Angiogenesis is initiated during this phase as well as reepithelialization as keratinocytes from the wound edge migrate across the wound surface. The authors articulate review of the pathophysiology of scar formation applies directly, and aligns perfectly, with what I have observed after performing thousands of hair transplant surgeries since 1993. 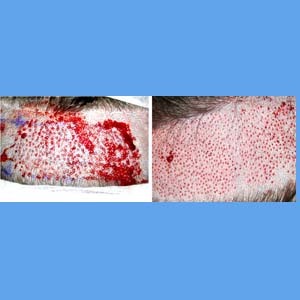 Of note is the third stage of healing called “remodeling”, because it is here that the so-called “scarless” procedure of FUE is shown to be false and the detrimental effects of FUE scientifically exposed. FUE advocates, primarily those who only perform FUE claim or infer that the FUE procedure is either scar free, scar less, or produces a “superior” scar compared to FUT. To support this they claim to be using punches less than .8mm in diameter and then further claim that due to the small diameter the amount of tissue damage is likewise minimal and therefore the scar formation thereafter is minimal. I have argued the opposite since 2005 when it became clear as the number of grafts removed via FUE began to exceed 2,000 in a single session that the donor area was being injured far more than a comparable sized FUT procedure. Even one that was twice as large. I had noticed that the quality of the skin throughout the entire donor area had changed after large FUE procedures. It had lost its natural elastic feeling and took on a harder and firmer type feel. When viewed pathophysiologically, as explained in the paper reviewed above, this was due to the replacement of Type III collagen for Type I collagen in order to strengthen the wound. In and of itself this would do little to the donor area, however, in FUE megasessions THOUSANDS of these tiny holes are made, most of which tend to be within 1mm or less of each other and consuming almost the enitre donor area. The result is confluence of scar that results in the entire donor area become affected, even the areas between graft extraction attempts. Skin that is more brittle and loaded with type I collagen tends to have less vasculature and thus may support fewer hair follicles. The result ? Actual hair LOSS within the donor area. Contrast this to the healing that occurs during FUT scar maturation. 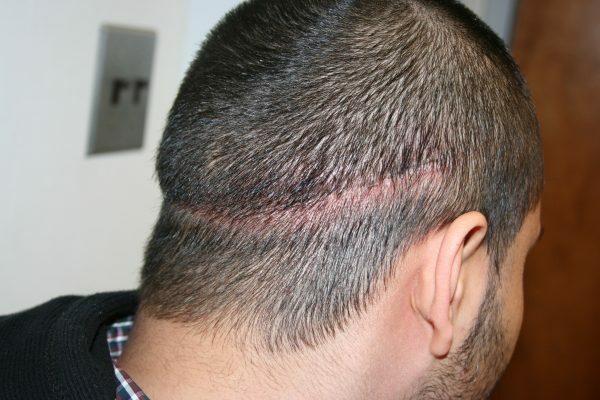 It undergoes the same three stages, but because the scar is confined to only one line running along the back of the head almost none of the rest of the donor area goes through the remodeling phase. This leave more virgin donor area to be harvested at some later time. Avoid FUE for large hair transplant cases. Patients with levels of loss beyond 1,500 grafts should only be scheduled for FUT procedures. This doubly applies if the potential for future hair loss is high as in young patients and those with significant family history of hair loss.